In loving memory to Howard Zinn, one of DS’s most well known Featured Writers. He will be deeply missed. Treasury Secretary Timothy Geithners denial that he played any role in the AIG cover-up is contradicted by emails which confirm that both Geithner and the New York Federal Reserve were both intimately involved in keeping details about payments to banks including Goldman Sachs from the public. ¿Plata o plomo? Colombian and Mexican drug gangs ask government officials, judges and police officers which they prefer, “silver or lead,” when offering bribes and threatening violence. 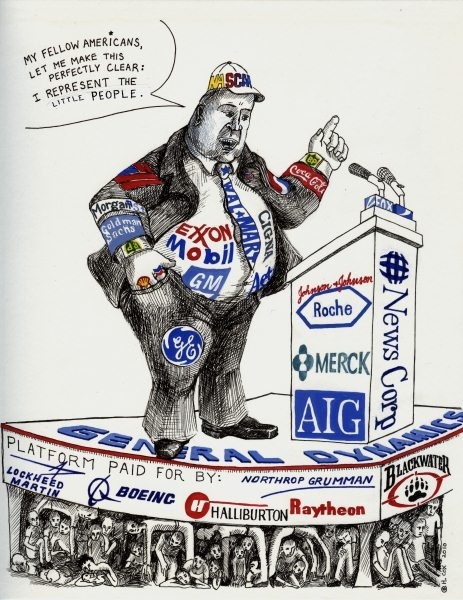 The U.S. Supreme Court decision granting corporations the same free speech rights as natural persons allows them to spend unlimited amounts of money to influence elections and public affairs. Corporations, foreign and domestic, can now force politicians to choose silver or lead when supporting or opposing corporate and foreign power interests. In his latest column for the New Statesman, John Pilger describes the “swift and crude” appropriation of earthquake-ravaged Haiti by the militarised Obama administration. With George W. Bush attending to the “relief effort” and Bill Clinton the UN’s man, The Comedians, Graham Greene’s dark novel about exploited Haiti comes to mind. Thanks for your recent emails. Yes, the distinction between earned and unearned wealth is indeed critical. And yes, I agree with your identification of monopoly control of resources as being at the root of the problem. Of course the chief monopoly is that of creation of money which governments share with the international banking oligarchy. 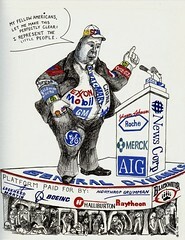 It is through the monopoly of money-creation that the oligarchs and militarists gain hegemony. Keynesian economics was the stroke of genius by which unlimited wealth could be funneled into the hands of the war-mongers with the bankers reaping the profits. Lately an incredible quote from President Andrew Jackson’s 1837 farewell address has been circulating on the internet. For all those who have begun to see the evils that have befallen our nation since it was taken over by the banking oligarchy this is a MUST READ.
. . . In reviewing the conflicts which have taken place between different interests in the United States and the policy pursued since the adoption of our present form of Government, we find nothing that has produced such deep-seated evil as the course of legislation in relation to the currency. The Constitution of the United States unquestionably intended to secure to the people a circulating medium of gold and silver. But the establishment of a national bank by Congress, with the privilege of issuing paper money receivable in the payment of the public dues, and the unfortunate course of legislation in the several States upon the same subject, drove from general circulation the constitutional currency and substituted one of paper in its place. Every week Max Keiser looks at all the scandal behind the financial news headlines. This time Max Keiser and co-host Stacy Herbert look at the scandal behind the headlines about the Volcker plan, the Supreme Court ruling and about Central Banks robbing the middle classes. Keiser also speaks to Fred Harrison, the Renegade Economist, about property bubbles and privatizing wages. The first part talks about Obama’s 1st 100 days, but the other parts go into many different topics, including activism, education, and of course, history. On May 2nd, 2009, the International Socialist Organization invited Dave Zirin sitdown and interview renowned historian Howard Zinn.